I love simple vegetable side dishes like this, especially ones that bring back such fond memories of growing up on the farm. In early July my mom would often “steal” baby red potatoes from the plants in our garden. 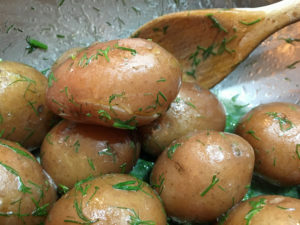 Instead of digging up the entire plant, she’d run her fingers in the soil under the plant and “steal” a few small potatoes to make this dish, allowing the rest of the potatoes to grow larger over the next few months before harvest. Being able to buy baby red potatoes year-round in Northern California is a blessing. I can make this side dish any time my husband offers to grill or smoke lean cuts of beef like tri-tip. Place potatoes in a 3 to 4-quart saucepan with a lid. Fill pan with enough cold tap water to fully cover the potatoes, and place lid on saucepan. Place saucepan on stove over high heat. Once the water comes to a boil reduce heat to medium and cook for 20 minutes. Check doneness of potatoes by piercing a few with a paring knife. If the knife pierces the potato easily, the potatoes are done. If there is some resistance, allow the potatoes to cook for 3-4 minutes longer. Drain the water from the pan, then add the dill, butter, salt, and pepper. Use a rubber spatula to gently toss the potatoes with the butter-dill mixture. Serve immediately or hold covered over low heat until ready to serve.